The 2015 Nissan Rogue can meet the needs of nearly any driver, thanks to the compact crossover sizing, versatile interior, and performance capabilities of this SUV. Whether you’re seeking a car for yourself, for your family, or for your business, the 2015 Nissan Rogue can add convenience, ease, and style to your life. The 2015 Nissan Rogue can seat five to seven passengers, depending on the trim level and seating configurations of the compact SUV. This crossover is excellent for those looking for a vehicle for their entire family. Individuals can also take advantage of the spaciousness of this vehicle for transporting cargo. The 2015 Rogue offers 70 feet of cargo space in the interior when both rear rows are folded down. With the Nissan Rogue, you never have to leave anything behind. The 2015 Nissan Rogue has a soft suspension that maintains a smooth ride. Potholes and bumps in the road are no match for the relaxing ride this compact crossover SUV provides. The Rogue also has a 2.5 liter four-cylinder engine equipped with a continuously variable automatic transmission for control and a nice performance for those behind the wheel. The engine can create 170 horsepower and 175 pound feet of torque. You can also find this vehicle with available all-wheel drive, which is excellent for those who tend to drive in various weather conditions. 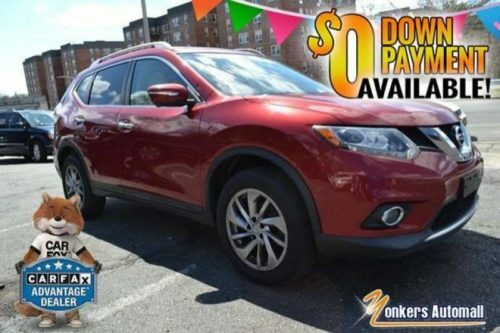 You can get behind the wheel of this compact crossover SUV for yourself by paying a visit to Yonkers Automall. At our used vehicle dealership you can find the 2015 Nissan Rogue and several other outstanding SUVs. Find Yonkers Automall at 1716 Central Park Avenue in Yonkers, or give us a call at 855-700-9198 to learn more about what we have to offer.